I typically don’t cry during sad movies, however this changed after I watched Netflix’s new release The Boy Who Harnessed The Wind. This captivatingly profound film is based on the true story of a Malawian engineer, William Kamkwamba. In 2006, Kamkwamba studied the book Using Energy and was inspired to invent a wind turbine, which could power any electrical appliance in his house. For his first professional role in a major motion picture, thirteen-year-old Maxwell Simba played the role of William and he did so might I add, excellently. While we watch despairingly as Malawi’s harvests are destroyed due to the heavy rains and inevitable droughts, the film brilliantly incorporates subliminal themes of government corruption and the negligence of the population’s suffering. William is expelled from school due to the lack of his family’s income, however he cleverly negotiates a deal with his teacher (blackmail), which allows him to use the library at his own will. Here, William educates himself on how wind power can create water, and thus, grow grain. 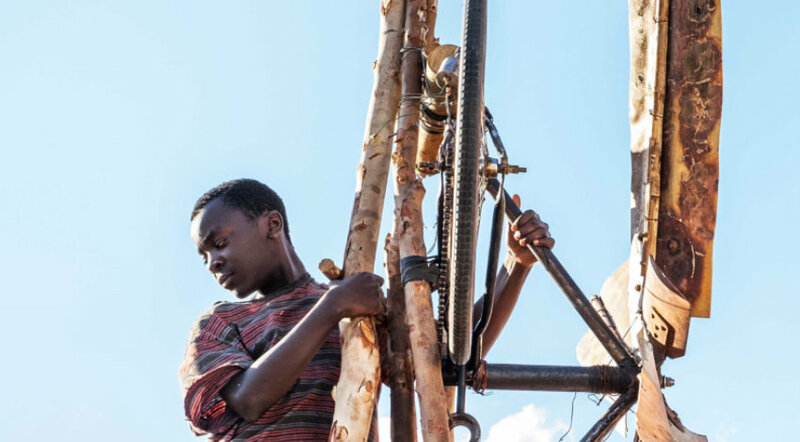 Watching a young boy living in famine go to the junkyard to repurpose bicycles and scrap metal o create a successful irrigation system is not only emotional but inspiring. If it wasn’t obvious already, I highly recommend this film. Whether or not you cry like I did, I hope that when you realize that this film is based on a true story, it will leave you feeling grateful to your unlimited quantities of accessible drinking water.